If you know the adjustment session GUID (or any part of this) you can enter this in the Adjustment Session GUID entry box. 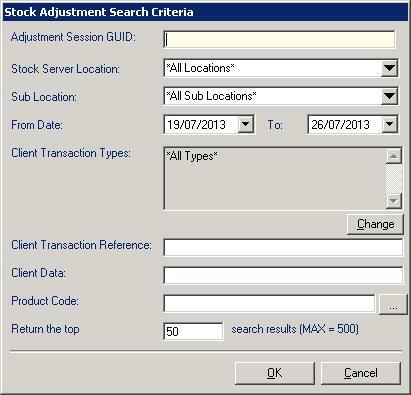 You can specify a Stock server location and sub location to narrow search results, as well as specifying the date range and client transaction types. There is also a date range to further narrow results. 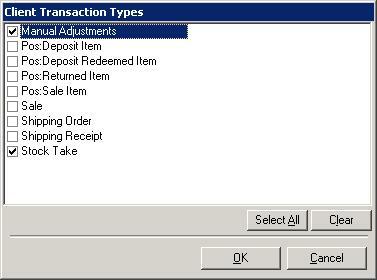 Other criteria include specifying all or part of the Client Transaction Reference and Client Data, a particular product code (which can also be searched for by pressing the “...” button next to the product code entry field), and the total number of results to return.